Polycom Trio™ 8800 is the conference phone reimagined for larger conference rooms. Marrying our world-class audio conferencing experience, with business-class video and content, the Polycom Trio connects to the leading unified communications platforms of today and tomorrow. 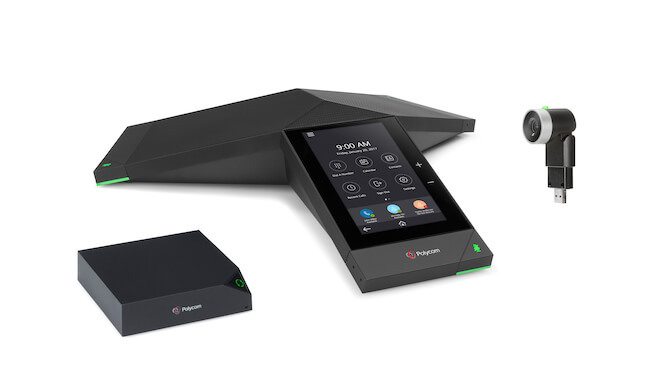 Polycom Trio is a revolutionary conference phone offering stunning room-filling sound for the best conference experience – ever. With a 20-foot pickup range and advanced audio technology such as enhanced Polycom® HD Voice™ and the patented Polycom® NoiseBlock™, conversation flows naturally and you hear every word clearly. Working together with Microsoft, we have designed the Polycom Trio 8800 to maximize the power of Skype for Business and Office 365 Cloud PBX powered by Skype for Business online. Polycom Trio conference phones are the only Skype for Business certified conference phones on the market. Even though Skype for Business may be your primary platform, if you choose to add others, Polycom Trio can do that – no problem. Enter your email address for updates about interesting new technologies, product and solutions.